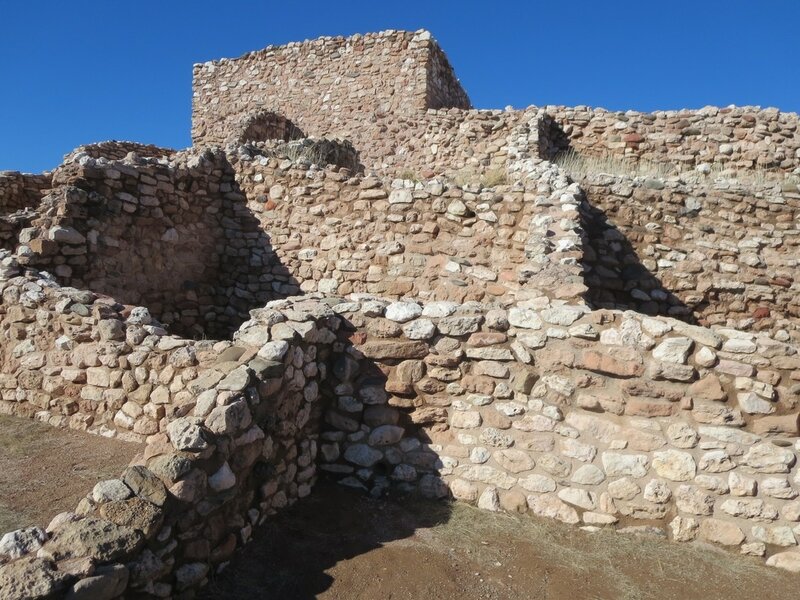 Tuzigoot is an Apache word meaning “crooked water,” a reference to nearby Peck’s Lake. The pueblo was abandoned about 1400 for unknown reasons and did not receive much attention until the 1930s. During the Great Depression, local interests, using federal money from the Work Projects Administration, began excavating pueblos in Yavapai County. Archeologists Louis Caywood and Edward Spicer began digging at Tuzigoot with 50 laborers in October 1933. They discovered and rebuilt 86 ground-floor rooms, found 415 burials, 178 pottery vessels and 30 baskets. The United Verde Copoper Co. and its successor, Phelps-Dodge, donated about 42 acres for what became a national monument. The mining companies had extensive operations in Jerome, a smelter in Clarkdale and developed a company town in Clarkdale around 1914. The restored Tuzigoot pueblo and a museum opened in early 1937. President Roosevelt issued a proclamation establishing Tuzigoot July 25, 1939, making it the 27th national monument. Its operations budget for fiscal 1940 was $3,500. Visitation was 6,125 in 1940 and peaked at 138,684 in 1992. 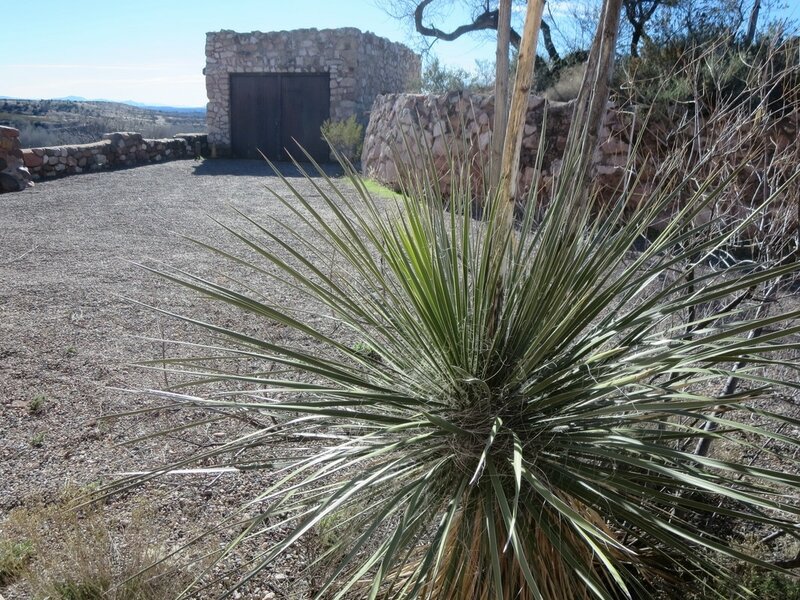 The historic visitor center, made with local stone, is one of the oldest for a national monument. Most parks have newer visitor centers constructed during the 1950s-60s. A short path leads visitors around the Tuzigoot rooms on top of the mesa with sweeping views across the Verde Valley to Clarkdale and Jerome on the slopes of the Black Hills. It takes about 20 to 40 minutes to tour the pueblo and perhaps another 20 minutes to see the displays of pottery and other artifacts in the visitor center. The archeologists Caywood and Spicer determined that the pottery found at Tuzigoot is identical to black and yellow pots found in a Hopi Pueblo IV excavation. Tuzigoot is located above an area where tailings from mining and smelting operation were dumped. That has created environmental problems with dust from the tailings blowing across the pueblo and heavy metals leaching into the Verde River. But it was that issue that precluded development of a housing subdivision about two decades ago. The United Verde Copper Co. built a nine-hole golf course at nearby Peck’s Lake in the early 1910s. It was one of the state’s oldest courses. But the Verde Valley Country Club closed in October 1991 as plans were unveiled for the housing subdivision. Tuzigoot's rooms are on a mesa above the Verde River and near Peck's Lake. Tuzigoot has one of the oldest visitor centers among national monuments. Excavation and restoration of Tuzigoot began in October 1933. 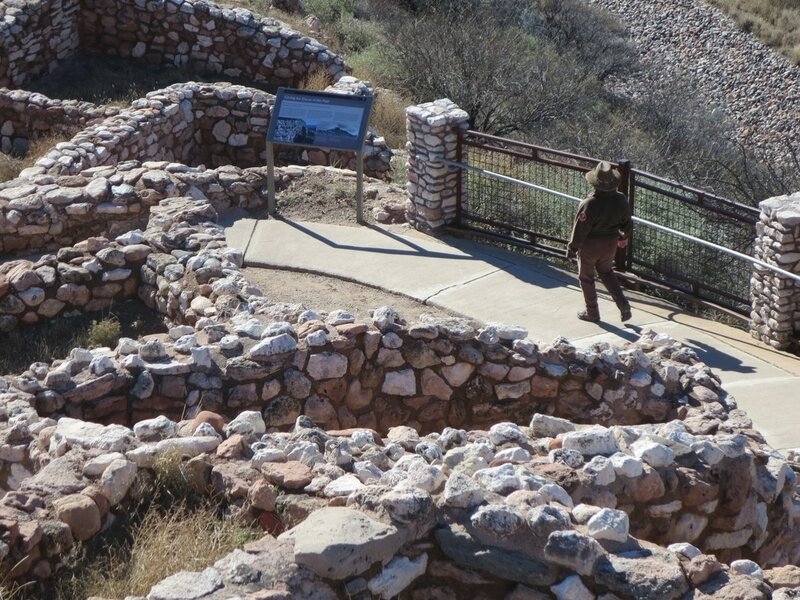 A paved path circles the reconstructed Sinagua pueblo and it takes about 20 to 40 minutes to see the site.